Take all the payment types your users expect. Safe, easy to use and with no extra cost, ACH payments are a win-win for anyone taking recurring payments. 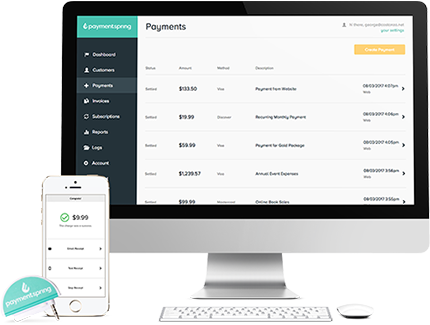 Plus, everything goes straight to your dashboard, so you’ve got all your payment info in one place. Just put it all on the card—PaymentSpring accepts credit and debit payments from all the major card brands: Visa®, Mastercard®, American Express® and Discover®. These days phones are pulling double duty. That’s why we make it easy for you to take Apple Pay®, Google Pay™ and Samsung Pay® payments. Want to participate in the USDA’s SNAP program? Work with us to become an authorized retailer and accept electronic benefit transfer payment cards as easily as you would a debit or credit card. Doing business with old-fashioned types? No problem—we love a classic. Use your mobile device to capture and deposit checks in seconds. By downloading an app, you can snap a picture of the check to have it added to your Gateway with your credit card payments and ACH deposits. Avoid the hassle of handling money. Spend less time managing deposits. Save yourself a trip to the bank. Contact us to learn more or to set up your check acceptance app.